This is Egypt’s biggest mall. 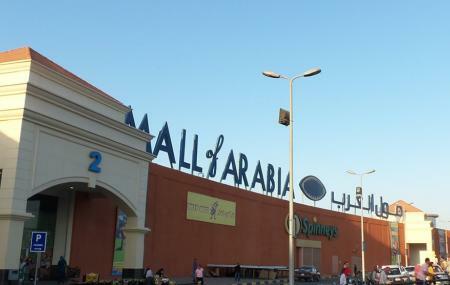 The Mall of Arabia Cairo has the most amount of outlets in comparison with any other mall in the country. They also have a kids play area with special supervision. There are plenty of restaurants and cafes here too. The mall features several international brand stores as well. There is a dancing fountain show in the evenings that is a true delight to the eye. There are 23 gates to the mall and you can even purchase a car from here. How popular is Mall Of Arabia Cairo? People normally club together Cairo Opera House and Arcade Club while planning their visit to Mall Of Arabia Cairo. People also prefer to end their day with Mall Of Arabia Cairo. Mall of Arabia is one of the largest shopping centers in Cairo and Including a large number of shops, restaurants, cinemas and gaming venues, accessible through its 23 gates. The Mall of Arabia simply provides you with everything you need from the needle to the rocket. You can shop in the decorative section, which includes many home items such as furniture and antiques from the largest international companies. You can also browse the shops that show the latest devices in the world of technology such as computers, telephones and others. As well as shopping in stores that include fashion products of various clothing, shoes and perfume of the most famous brands of men, women and children. Access to the mall's cinemas and enjoy watching the latest exclusive movies as they descend through 13 huge screens is a truly memorable experience Eating the most delicious dishes in the restaurants inside the mall and enjoying the view of the dancing fountain during a cup of coffee in one of the cafes overlooking it is more than wonderful. Good place for shopping, almost everything a person can need is present in this place. Food court was amazing with variable choices of food, there's Indian, Asian, Lebanese, Italian, Egyptian and of course fast food. The service was not so great but acceptable. Overall the place is excellent and I would highly suggest it to a friend. Big complex, great location in October City, Cairo Egypt. Has veriety of international and local stores. Unfortunately no Starbucks or any international coffee shop. Price is moderate, and great customer services. There are couple of mall information desks . Nice view two stories some section of the mall. Nice. This mall is huge and has so much to offer. It’s about 25mins out of the main city without traffic expect more in peak times. It has all the popular shops and a huge food court with a variety food outlets on offer. Great outdoor area with lots of restaurants and cafes to choose from. It’s great place to visit and shop at.